With my head grazing the mat below me, it’s hard to ignore the urge to right myself. Luckily, my legs, in a tangled web of hammock, are keeping me comfortably locked in my dangle. This is the upside down world of aerial yoga or anti-gravity yoga, if you prefer. This alternative to traditonal mat yoga is peaking in popularity thanks to it’s beauty and its promise to make every yogi fly. 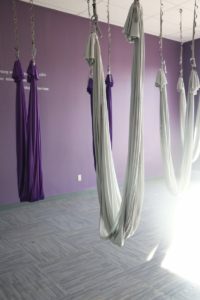 Founded by Kristine McCreary, Anti-Gravity Yoga Lab in Emmaus aims to bring this dance, art, fitness trifecta to residents of the Lehigh Valley. For those new to yoga, like myself, McCreary is approachable and quick to find solutions for all of her newbies. Take for instance, my left foot that simply won’t bend back far enough to reach the hammock for a bird- on-one-leg like pose. “Try bending over, looking back and then placing your foot in the hammock,” She offers. Close, but no cigar. My left foot isn’t interested in this pose, perhaps the next one will be more to its liking. McCreary has been teaching anti-gravity yoga for five years in addition to her full-time job as a realtor. It’s no wonder she pursues yoga. The yoga lab teaches both mat yoga and anti-gravity, offering workshops for devotees and introduction classes for anyone looking to get their feet wet. McCreary says yoga doesn’t have to be one-or-the-other, “anti-gravity yoga is a great complement to mat yoga,” she says. Misled by the beautiful and unassuming photos of aerial yoga, I assumed that it would be a very tranquil lesson in meditation and stretching. I was wrong. Aerial yoga is quite aerobic, so expect to break a sweat. It’s advised that you bring water to rehydrate and a towel to keep cool and dry, as well. Honestly, if you don’t feel the burn, you didn’t do it right. Aerial yoga also has benefits outside of being a great workout. Kyla Makovsky, A dance major at Ohio State University, takes aerial yoga as a way to reduce the impact on her joints and muscles while still getting a great workout. Beyond the physical benefits, aerial yoga is a great way to explore your own “hang ups.” As a child, tumbling and gymnastic-like moves were easy. I feared no consequences, and let’s face it, I was much more flexible then. Evidentally, I have developed a mental block that insisted on warning me everytime I was precariously perched that I could fall. “The endorphines last so long,” says Erica Tramuta-Drobnis, a newcomer to aerial yoga. 1. Take an introduction class, learn the mechanics and familiarize yourself with the terminology and forms. 2. Build up your flexibility and be consistent – taking a day or even a week off can cause muscle tension to build back up, making it harder to get back into your groove. 3. Enjoy it! If you’re like me and want to recapture your younger self on the monkey bars, try aerial yoga, branch out and don’t be afraid to do it wrong. My experience with aerial yoga was different than I had anticipated, leaving me feeling good about the workout and proud of myself for trying something new. In the hustle-and-bustle of everyday life it’s easy to develop a routine. Anti-gravity yoga offers a break from the monotony and the ability – if only for a second – to fly.